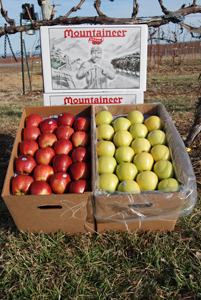 West Virginia’s Finest Distributed Throughout the U.S.
George S. Orr & Sons, Inc. is located in Martinsburg, WV on one of the last remaining pristine orchards in the area. Our company grows, stores, and packs more than 400,000 boxes of high-quality fresh West Virginia tree fruits annually. George S. Orr & Sons, Inc. is a family business, which was founded in 1954 by George Orr himself. It is now managed by two brothers who represent the second generation of the family to run the business. The brothers (Mike and Mark) and their families, grow fruit on over 1,000 acres of apple, peach, nectarine, plum, and pear orchards in Berkeley County. George S. Orr & Sons, Inc. will purchase fruit from other nearby growers, but grows an astonishing 95% of all fruit that is packed at our facility. George S. Orr & Sons, Inc. grows, packs, and ships around 10 varieties of peaches and over 20 varieties of apples each year. Our premium fruits are grown using the utmost care by Mark Orr, owner and orchard manager. The fruits are all carefully harvested by hand and then stored on farm in our controlled atmosphere and cold storage units. Fruits are sorted by gentle electronic sorting systems and graded to the exact color and size that the customer desires. The company also has the capacity to individually sticker fruit with variety information and PLU numbers when required. We are also proud to state that our packing facility is GAP/USDAcertified for food safety regulations. George S. Orr & Sons, Inc. is known for a wide variety of quality fruits. Don Dove is packing systems and production manager and he oversees the packing process to make sure that all orders are satisfied properly and consistently. Call Mike Orr, co-owner, or Don Dove in the sales department to discuss your apple marketing needs. Our sales staff may by reached by calling 1-304-263-1027 or by emailing us at orrsdon@gmail.com. Don Dove grew up in Jefferson County, West Virginia and attended Jefferson High School. Don then graduated from Shepherd University in 2002 with a degree in Information Technology. Don joined the farm in 2009 and found that his previous jobs as electrician and insurance salesman have come in useful on the farm. His areas of expertise are helping to run and program the packing shed computer operation system and managing the 40 or more employees working on the packing line. Don also assists Mike with the Wholesale Sales department and enjoys customer relations. Don and his wife Katy currently live on the farm. Don is an active member of New Life Community Church in Arden, West Virginia and enjoys mud bogging with his truck.